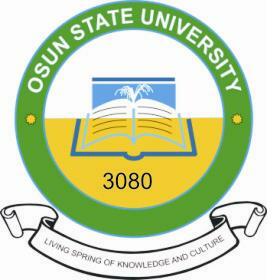 Osun State University, UNIOSUN cut off mark for the 2018/2019 academic session admission exercise. If you scored exactly or above UNIOSUN cut off mark, that means you are qualified and eligible to take the Post UTME screening exercise, and getting marks below cutoff means you are not eligible or qualified for UNIOSUN post UTME. Osun State University is a multi-campus university established by Osun State Government under the administration of Prince Olagunsoye Oyinlola. The university currently operates six campuses distributed across the six administrative/geopolitical zones of the state. Nigeria’s National Universities Commission approved Osun State University on December 21, 2006, as the 30th State University and the 80th in the Nigerian university system. It has its campuses in Osogbo, Ikire, Okuku, Ifetedo, Ipetu Ijesha and Ejigbo. The management of the Osun State University (UNIOSUN) has released the cut-off mark for the 2018/2019 academic session admission exercise. Only candidates who chose Osun State University as their First choice, with a minimum score of 160. Meanwhile, candidates who chose any of these courses but scored less than 200 could change to any other relevant programme of their choice. Post UTME Past Questions and Answers. Please what is the cutoff mark for medicine? if someone got 198 in jamb and scored 50.7 in post ume for industrial relations and management…will he or she be given admission? Comment Text*What is the departmental cut off mark for mechanical engineering. l scored 214 in my Jamb and l had b3 in my maths and physics and c4 in my other subjects .Can l be given admission to study nursing in uniosun? can I get into uniosun with d7 in lit-in eng. which course is more suitable and advisable for me? What is d departmental cut off mark for nursing and public health . Can study nursing with 206 in jamb . Please sir when is the 2018 post utme coming out? Not yet announced. Bookmark this page and keep checking back. Please can i get your contact?